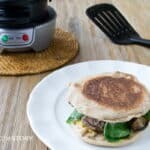 Today I’m bringing you an easy burger recipe cooked up on the Hamilton Beach Breakfast Sandwich Maker and a chance to win a Breakfast Sandwich Maker of your own. Back when The Hubs and I were first together, way before kids, we’d lay in bed on Sunday morning and imaging a machine that would cook breakfast for us while we dozed. What we had in mind was like a programmable coffee maker but for breakfast. It would be a refrigerated unit to which you add raw bacon, a cracked egg and some bread before going to sleep. And then, just like on the days when mother’s visiting, you wake to the memory-tugging meaty maple smells of bacon frying, and you know that it is going to be a great day. While at BlogHer Food in Austin a couple months ago, I had the opportunity to taste a sandwich made on the Hamilton Beach Breakfast Sandwich Maker. The breakfast sandwich was really good but I honestly wondered who needed an extra contraption like this in their kitchen. I mean, why not just use a frying pan? But then they sent me a Breakfast Sandwich Maker. And I used it again. Seriously, this machine takes seconds to load up with breakfast ingredients. Then you can go check your email and, moments later breakfast is served. You have to make one sandwich at a time but I’ve found that with everyone running around in the morning anyhow, it usually works out (although I am tempted to buy a second machine so that I can have two sandwiches going at once!). I love this gadget so much that I’ve experimented with it for lunch and dinner. 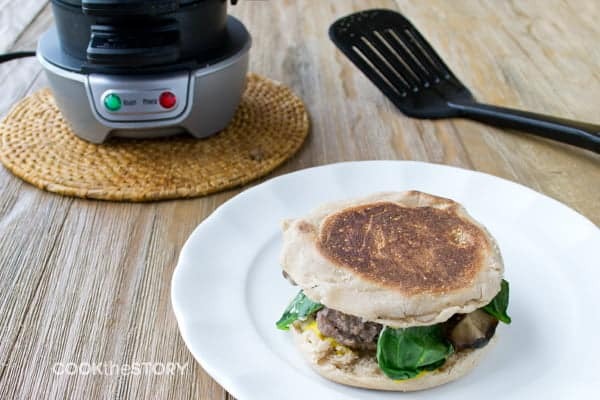 What I’m sharing today is an easy burger recipe made on the Hamilton Beach Breakfast Sandwich Maker. This is the perfect easy burger recipe to roll out on a weeknight when everyone is in a hurry and is eating at different times. You make sure to have the burger patties cooked up and then you make everyone their own burger as needed, each one ready in moments. I’ve experimented with different kinds of breads and buns. The Breakfast Sandwich Maker works best with English muffins and other very flat breads (pita cut into rounds, regular sliced bread cut into rounds, thin bagels, etc.). If the bread (or bun) is too thick it becomes hard to close the machine and sometimes the top and bottom of the bun will burn. I’ve therefore used Whole Wheat English muffins for this burger recipe. What else is in this easy burger recipe? There’s melted cheese and, get this, the level of the Breakfast Sandwich Maker that is usually used to cook the egg is instead used to lightly sauté some mushrooms and spinach. 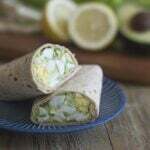 Tasty, healthy and quick. What more could you ask for on a busy weeknight? For another fun twist on burgers, be sure to also check out my bacon burger recipe, where the bacon is inside of the burger. 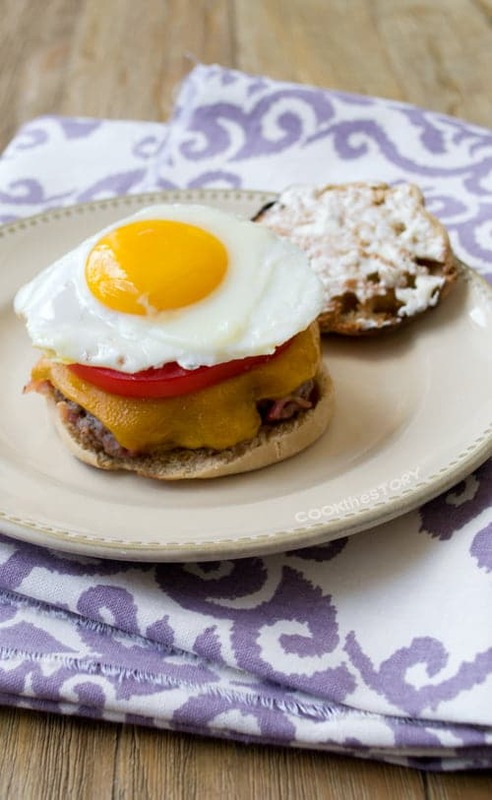 Now, here’s the easy burger recipe using the Breakfast Sandwich Maker. This burger comes together really quickly making it the perfect meal solution for those days when everyone is coming and going and eating at different times. Preheat the Breakfast Sandwich Machine as instructed in the manual. In a medium bowl combine the spinach, mushroom and olive oil. Set aside. Divide the mustard among the 4 English muffin bottoms and spread it on. Divide the mayonnaise between the muffin tops and spread it on. Put a muffin bottom into the lowest level of the breakfast machine maker. Top it with one slice of the cheese and then the cooked burger patty. Slide the cooking plate into place and put 1/4 of the spinach mixture onto the plate. Top with the muffin top and close the machine. Cook for 3-5 minutes, until the burger is warmed through and the cheese is melted. Slide the cooking plate out (causing the spinach and mushrooms to fall onto the burger patty. Open the machine and use a spatula to remove the burger. Repeat step 4 with the remaining ingredients. Disclosure: Hamilton Beach gave me a Breakfast Sandwich Maker to review and they have given the one that I used for the giveaway in this post. They did not pay me. All opinions are my own. I would make a chorizo, egg and cheese sandwich. I would spread some refried beans on the bread before placing it on the machine. Used mine first time yesterday. I will make a trip to McD just to get egg mc. Don’t have to now! Get one and in under 10 min. you have a great breakfast. Get one and save time and money! Fay, Agreed! Isn’t it such a great machine? Thanks Tommy! I actually was still using it sometimes but then a friend’s daughter was heading to college and I thought it was the perfect thing for her to take with her. She uses it all the time. I’m thinking of getting one of the dual models maybe. Hamilton beach now makes a machine that does two sandwiches at the same time! I bought the HB breakfast sandwich maker at Bed Bath & Beyond(that 20% coupon makes it super affordable). I gave this to my husband yesterday as part of his birthday present. We used it this afternoon for lunch. We used English Muffins, sliced cheese(he used a hot pepper and I used American)and deli sliced turkey. After 5 minutes the egg was perfectly cooked and the meat was hot. The cheese was gooey as someone already mentioned, but I think it made the sandwich even better. I put salsa on my sandwich after it cooked and husband put deli mustard. We enjoyed this so much. I agree about having 2 of these on hand. That way you don’t have to wait to sit down and eat together. We are both in our 60’s and will probably use it at least a few times a week. I’m excited about experimenting with a pizza version. A side note: I found spraying a paper towel with the non-stick spray and then wiping it on the rings, was much easier than trying to spray and hit the right spots. I like the idea of this recipe; using the unit for something other than breakfast. But I’d like something clarified…any meat used is in the un-frozen state, yes? I’d like to use sausage rounds, but wondering if they have to be defrosted first. Ev, Fully cooked and defrosted. So if they’re cooked but frozen, defrost them in the microwave for a few seconds. They don’t have to be hot. Just not ice cold. Thanks for a great question! Here’s a discovery I made today. I wanted the option of using regular bread instead of using English Muffins, but was concerned about the sizing. Here’s what I discovered….If you have one of those burger patty makers, you know the ones that you put a mound of hamburger meat in and push down on the ‘plunger’ to make the preformed patty? Well the middle part is the right diameter. Put on the slice of bread you want to use, and you can cut it out like a cookie cutter, or trim the outside bit off, and it’s the perfect size. Also good to use on sliced cheese to make it the right size. Same thing for any brand of sliced meats. I have a set of various sized round cookie cutters and one is just the right size to cut slices of bread to fit in this sandwich maker. Thanks for all the great tips, Doug! Love that you’re experimenting with it and figuring out what works best. My breakfast maker just arrived today…can’t wait to try it out. So happy you’ve got a breakfast maker. Do let me know how it works out for you! I love it! It’s so easy to use and cleanup is a snap! I have been trying different sandwich combinations that always turn out great! I just got one of these machines and absolutely love. The possibilities are endless! Thanks for the tip on the burger. I made my sandwhiches with frozen pancakes, back bacon, shredded cheddar (first one with American cheese that melted all over the machine) and an egg. Fantastic!! Also have croissants to try as well as frozen waffles and English muffins. And I have Chelsea bread and raisin bread to cut with a large cookie cutter to the perfect size. Spend a day and make your own waffles and pancakes to freeze. Kids will love this machine. A little prep the night before and your breakfasts will be amazing!! I love the idea of the pancake sandwiches. So so so brilliant. I’m definitely going to give that a try very soon. The thought is so tasty I might just go make one right now! Bacon, egg and cheese!!! mmm! I’d make an egg and cheese breakfast sandwich!! Oooh…. Egg, bacon, and avocado. YUM! Linguisca (portuguese sausage), muenster cheese, avocado, and egg sandwich! Love the recipe and the use of the sandwich maker! Now my head is spinning with different ideas on what to cook. Thanks! Anything with bacon!! !! Bacon, egg & cheese! I have been trying since you guys had the first contest to get one of these! I WANT ONE!!!!! They really are cool machines. Good luck in this contest. I actually haven’t tried waffles on the breakfast sandwich maker yet. I am definitely going to try that soon. Great idea! I actually haven’t tried putting a biscuit on the Breakfast Sandwich Machine Maker. I bet it would work perfectly. Great idea! I would actually be making a rather basic sandwich of english muffin, egg with some sour cream and dill mixed in, and havarti cheese. The nice thing about this unit would be that the sandwich would be sealed shut making it convenient and less messy to eat on the train during the commute to work. Actually, this machine doesn’t seal the edges of the sandwich. It is less messy than a typical sandwich though because the egg cooks onto the lid of the sandwich a bit and helps hold things together. You have chickens? That’s awesome. I would love to have chickens. We’re not allowed in our HOA though. I’ll live vicariously through you, I guess! That’s what I tend to make, actually. I love the basics in the morning. I’ve always used a skillet too. Would like to try this gadget. It actually works really well. I love it for quick mess-free breakfasts and dinners but also for a midnight snack. It’s actually too convenient because I want more midnight snacks than I should really have! Great ideas! It does really work well for dinners too. I was surprised at how well, actually. My family loves it for those quick dinner sandwiches. would be great to use for breakfast, lunch or dinner! Agreed! It is a perfect gadget for anytime of day or night. Too perfect, actually. I find myself using it more often that I probably good for the sake of my waistline. I’d use waffles instead of bread, and fill it with egg whites, low fat cheese, turkey sausage, maybe some veggies. I would make an egg, turkey sausage and spinach sandwich on an English muffin! Never seem to find time to make anything good early in the morning and this would be great!!! I would make a copy cat Sausage egg McMuffin (like McDonald’s). Canadian Bacon,cheese and sourdough bread yum! I love bacon, egg & cheese bagels!!! I would love to make breakfast sandwiches for my picky eater.. would sure help with school! I’d eat whatever my kids made in this magical invention! How much would I love this???!!!! I’d love to try a ham and cheese sandwich on a whole wheat english muffin…like a nice Black Forest ham or maybe even go all out with pancetta and then add some brie or some other yummy cheese…I can think of so many delicious things to make with a Hamilton Beach Breakfast Maker! I’d love to make a healthy version of a sausage egg mcmuffin at home on a Hamilton Beach Breakfast Maker! I think your recipe sounds delicious (so it may be the first one I’d make). I think bacon makes everything better (although my husband and kids prefer sausage). There are so many possibilities! Thanks for the giveaway. Egg, cheese, bacon and avocado! I’ve been making breakfast sandwiches for years using my microwave. This could prove to be fun and lend itself to experimentation very well! 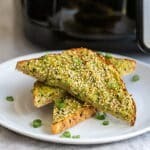 We are a ‘sandwich family’ and I just KNOW my 17 year old son would love this as he’s become quite the cook and is even developing his own recipes! I can see him taking this with him when he moves out after graduation and then I’ll have to buy another for me!!! lol!!! I would make a turkey sausage, spinach and egg white sandwich with a little Trader Joe’s Cowboy Caviar or pineapple salsa to give it some heat. I would make a turkey sausage, spinach and egg white sandwich on whole wheat, with Trader Joe’s Cowboy Caviar or pineapple salsa to give it some heat. haven’t heard of this gadget but I can see how my morning would improve! I absolutely adore my sandwich maker. My husband wants one in his office on his desk, LOL! Now he just needs a refigerated drawer for the ingredients! 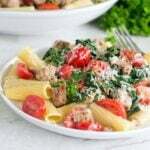 I would make some type of GF base then add eggs, tomatoes, garlic, and herbs…mmmm… The kids would love to help with this too! English muffin, turkey bacon, and egg white! Yum! Anything that gets us out of the house faster in the mornings and better than the drive thru. Looks like it would be great for those short order cook request. Pick and choose what to add in. Is it possible to have too many kitchen gadgets????? Ohhhhh I don’t think so!!!! This would make a super addition to my kitchen – I LOVE it!!!! Could be used for all kinds of sandwiches! I would like to make a bacon, egg, and cheese sandwich!! Fantastic idea!!! I would love to try! Bacon blue cheese burger, with mushrooms! I would make a bacon, egg, and spinach on an english muffin.